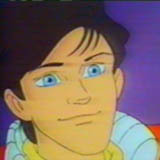 Kevin Keene, voiced by Matt Hill, is a teen from Northridge, California - a city on a planet known as Earth. He is selected by the Ultimate Warp Zone to become the savior of Videoland as Captain N: The Video Game Master. At first Kevin isn't sure he wants to stay in Videoland, but eventually he decides to stay and fulfill his destiny as protector of Videoland. Kevin cares greatly for Lana and his loyal dog, Duke. As Captain N, he has a powerful weapon called a Zapper which shoots laser-like beams of energy to dedigitize his enemies. He also wears a Power Pad, a wonderful item that provides him with the ability to jump much higher, run extremely fast, or stop time around him for a limited duration.